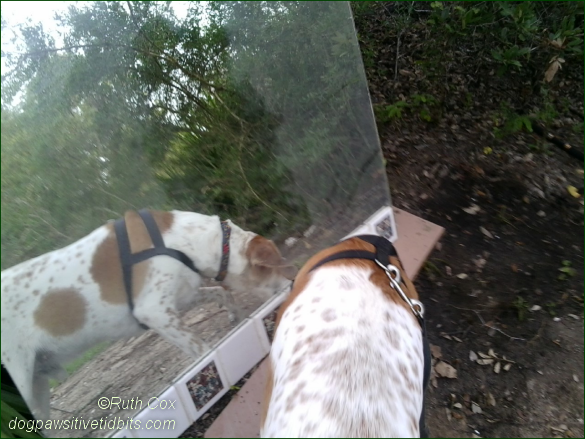 While it is common for dogs to show an interest in reflections in mirrors in the home, it is a bit strange to experience this while walking a dog in a rural area. It does happen! Yes, while walking my dog Valentino along a stretch of overgrown vegetation it was wild to see a large mirror propped up against the trunk of a tree. My dog's reaction was immediate ... Where is that doggie in the mirror? 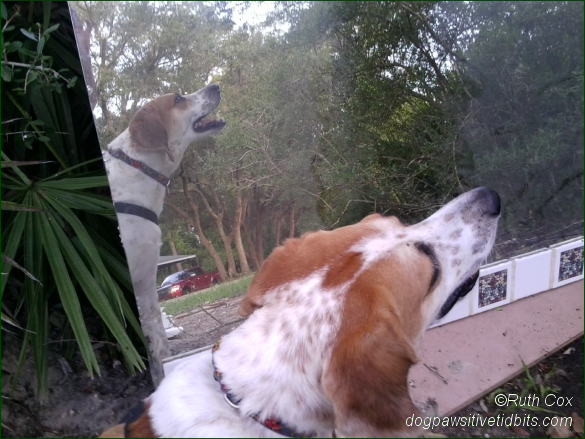 My dog Valentino looks for the dog in the mirror. First, Valentino looked alongside and behind the mirror for the "other" dog. Not there! Valentino sniffs the air for intruder scents. Next, my dog Valentino raised his head. 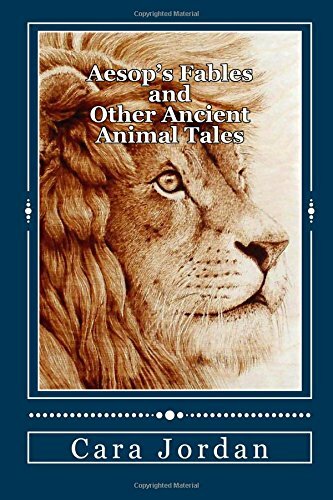 Ears, nostrils, and jawline quivered as he sniffed the air for the scent of the "other" dog. Still no intruder! Valentino sniffs the ground in front of the mirror for unseen dog tracks. 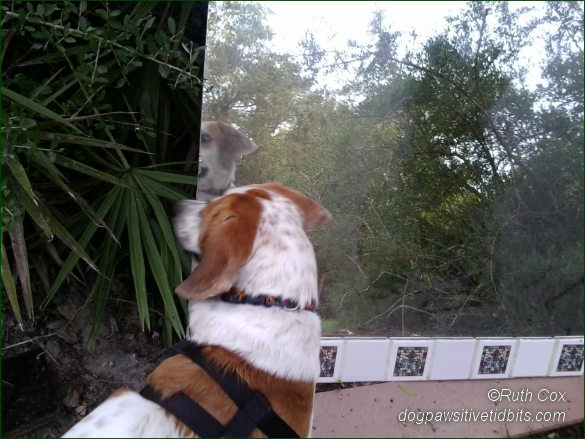 Then, Valentino sniffed the ground all around the mirror in search of a scent trail of that dog he thought he had seen in the mirror. Who knows where that doggie went? Sight, sound, and scent not found, Valentino was satisfied no other dog was in his walk territory and lost interest in the reflections in the mirror. 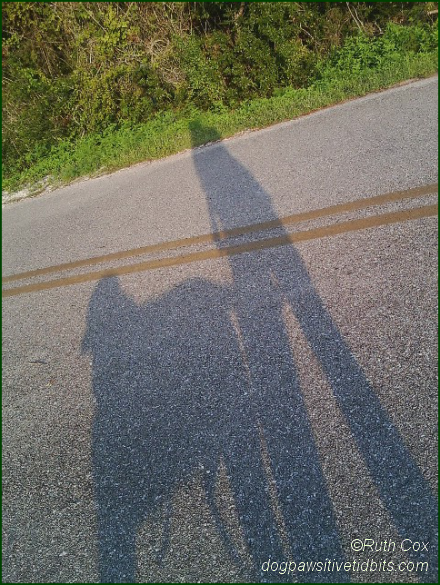 My dog and I were able to continue our walk. Shadow reflections of Valentino and Ruthi. As we walked, I had two thoughts in mind. One, Valentino may not have passed the dog mirror test but his nose made sense of the lack of intruder scents. And two, I chuckled at the memory of Aesop's Fable, A Dog and His Reflections, while being delighted by the shadow reflection on the asphalt of me and my dog. We had lost nothing but a few minutes of our time by the mirror placed in our path. Its unexpected appearance added to our dog walking reflections of this day. Note: If you look inside Aesop's Fables and Other Ancient Animal Tales at Amazon, you are able to read the dog tale! We enjoy Wordless Wednesday so much that we are linking up with both BlogPaws and Noner Says this week. 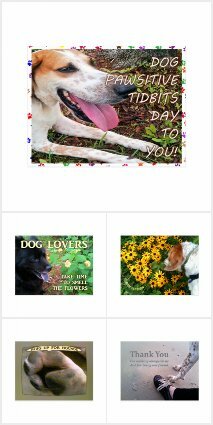 Visit their posts for many more links to articles of wonderful pictures of pets and animals as well as people, places, and things!